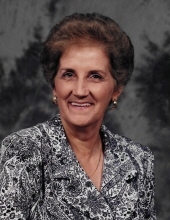 Ellen Marie Griffin Dearman, 84, of Moss Point, MS, passed away on Saturday, February 2, 2019 in Lucedale, MS. Ellen was born on April 30, 1934 in Evergreen, AL. Ellen was a member of Temple Baptist Church in Big Point, where she enjoyed attending her Sunday School class and serving her church family. She had a fierce love for her boys and grandchildren and was always devoted to her family. Ellen was one that never took things for granted and always put others before herself. She will be remembered as always being a hard worker, and for her love of working in her yard and tending to her flowers. Ellen was preceded in death by her husband of 68 years, Bodie Elkins Dearman, her mother, Emma Dearman, and daughter-in-law, Sandy Dearman. She is survived by her sons, Gary (Linda) Dearman, Rick (Mary) Dearman, and Kevin (Penny) Dearman; grandchildren, Matt (Kristi) Dearman, Mitch (Ashley) Dearman, Chase (Meagan) Dearman, Joe Dearman, Cord Dearman, Ashton Paige Dearman, and Seth (Meghan) Dearman; 8 great-grandchildren; brothers, Douglas (Judy) Dearman and Bobby (Linda) Dearman; along with numerous nieces, nephews, other family members, and friends. The visitation for Ellen will be held on Tuesday, February 5, 2019 from 10:00 a.m. until 1:00 p.m. at Heritage Funeral Home in Escatawpa, MS. The funeral service will follow in the funeral home chapel beginning at 1:00 p.m. with Rev. Ben Buckley officiating. Interment will be held at Serene Memorial Gardens with Joe Dearman, Cord Dearman, Mitch Dearman, Chase Dearman, Kevin Lucas, and Jeff McCarra serving as pallbearers. Craig Edwards will serve as an honorary pallbearer. To send flowers or a remembrance gift to the family of Ellen Marie Dearman, please visit our Tribute Store. "Email Address" would like to share the life celebration of Ellen Marie Dearman. Click on the "link" to go to share a favorite memory or leave a condolence message for the family.